Celebrate the impressive career of Dwayne "The Rock" Johnson with this comprehensive visual guide, which chronicles every step from his explosive WWE debut match to his full-blown superstar status. Dubbed "The Great One," for more than 20 years The Rock has delighted millions of fans with his charisma, catch phrases and championship wins - all captured in this stunning book. Discover The Rock's fascinating family history as the first third-generation WWE Superstar; his training and early years in the ring; his epic wins and greatest moments as The People's Champion; and his impressive movie career including his appearances in The Scorpion King, The Mummy Returns and the Fast and Furious franchise. Stunning photography captures The Rock's career highlights: headlining WrestleMania events and reigning supreme in matches against sports entertainment greats such as John Cena, Stone Cold Steve Austin, and Triple H. A must-have for any WWE fan, the WWE: The World of the Rock Hardcover Book reveals the whole story behind "The Most Electrifying Man in Sports Entertainment", both in and out of the ring. 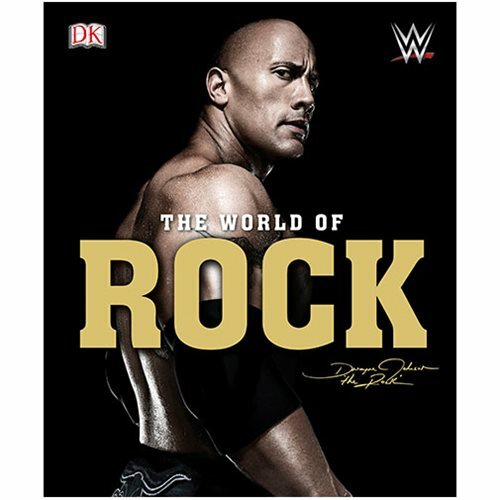 The WWE: The World of the Rock Hardcover Book is 160 pages and measures about 11 1/10-inches tall x 9 3/10-inches wide.